BEING TEXT OF A PRESS CONFERENCE ADDRESSED BY THE FORUM OF PDP GOVERNORSHIP ASPIRANTS IN BENUE STATE, IN ABUJA ON MONDAY, 23RD JULY, 2018. Gentlemen of the press, we have convened this occasion under the auspices of the Forum of Governorship Aspirants on the platform of our great party, the Peoples Democratic Party (PDP), Benue State Chapter, to the 2019 elections, to address you regarding our views and stand on recent events in the party as they affect Benue State. While there may be a broad range of issues to discuss about the party at the moment, for the purpose of this event, we are concerned more with those developments which tend to impinge, one way or another, on our aspirations on the platform of the PDP. 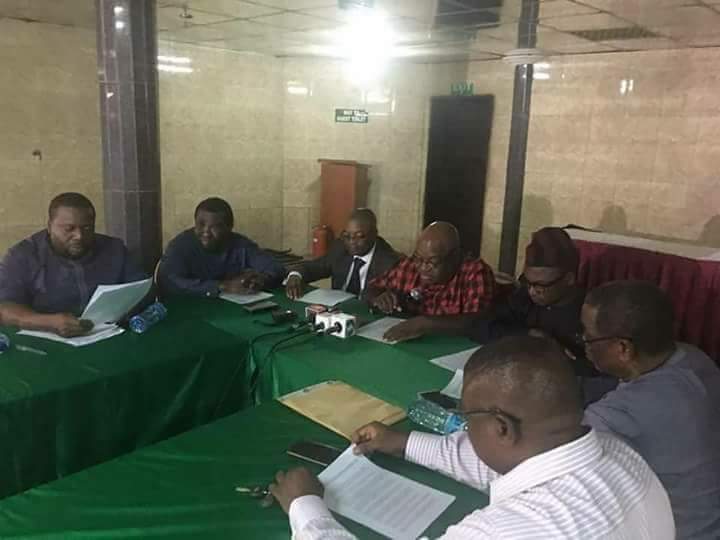 For clarity purpose, we are a group of 13 aspirants, one of which was the flag bearer and some who had ran in the 2015 governorship race in Benue State, and despite losing power at the polls, together with other well meaning party stalwarts and faithful, we went back to the drawing board, re-strategize and have since been involved in the work to revive and reposition the party in the state with a view to recapturing power at the next round of elections. Our faith in this regard has over the years been strengthened by the resilience and unity of purpose shown by the national leaders of the party, such as saw it emerge triumphant through a plethora of crisis, most notably the Sherriff saga, and the attendant historically successful National Convention of 2017 which produced the incumbent National Executive Committee of the party. It was against this backdrop of our undying faith in the future bright fortunes of the party, anchored on the positive and clearly focused leadership trajectory of its National leadership that we set sail early on, towards the goal of recapturing power in our state at the next round of elections. On this race so far, we have undertaken extensive consultation rounds, with many amongst us having covered the 23 local government areas of the state several times, meeting with party leadership organs at the various levels, statutory delegates, groups and individuals which constitute the potential pool from where shall emerge the ad-hoc delegates to the primary election. It is being modest to state here that our efforts have contributed in no mean measure to galvanizing, shoring up and maintaining the membership strength of the party, such that has made it quite the beautiful bride that it is presently. On a profound note too, it will be stating the obvious to reflect here that the party in the state has indeed been blessed with a rich crop of men and women who have held sway competently as its leadership organ at the state level. The State Executive Committee, under the leadership of State Chairman, Sir John Ngbede, together with our National leaders, in the persons of former Presidents of the Senate, Distinguished Senator David Mark, Distinguished Senator Dr. Iyorchia Ayu and the immediate past governor of the state, Rt. Hon. Gabriel Torwua Suswam and others, the Zonal, Local Government and Ward Executive Committees, the Zonal and Local Government caucuses, Elders, Stakeholders as well as women and youth groups, have kept our party on a steady path of growth and strength. Everyone who has interacted with the Benue State Chapter of the PDP from 2015 to this moment has come away impressed with the quality of organisation, depth and maturity of the party's composite structure and functionality. Benue PDP indeed has become a beautiful bride, a model worthy of emulation by other state chapters of our great party, and under such circumstance, it has never been lost on us that, as we head into the 2019 election year, the party will attract many seeking to pursue electoral ambitions on its, no doubt, stable platform. And indeed, there are many that we are aware are on their way to joining the party at this most opportune time. May we in the light of this reality first state that, we are mindful that the beauty and strength of any democracy anywhere in the world will always be hallmarked by the quality of participation obtainable therein, such as serve to aggregate the yearnings of the people for greater self determination and actualization. It therefore, goes without saying that even in our present circumstance, all political actors and leaders in the country, across political divides owe the Nigerian people a sacred duty to ensure that our democratic institutions and culture are nourished by an unhindered flow of robust participation which is based more in the will of the majority. May we recall here the assurances and guarantees given to us the governorship aspirants by the state leadership of the Benue PDP that we will be availed a level playing field in which a free, fair, transparent and credible primary election will be conducted to produce a governorship candidate for the party to the coming polls. Correspondingly, we have since pledged our unflinching loyalty and commitment to the party, and willingness to accept in good faith the result of such a nomination process, wherefore the one who emerges as the candidate will enjoy our undiluted support towards winning victory at the polls and recapturing power and enthroning a PDP Government in the state in 2019. It is our faith that the new National leadership of our great party, in the ongoing efforts to expand and boost the party's strength towards the coming electoral contest, will be mindful of this established template of cooperation, understanding and trust between we the aspirants and the party leadership and membership, which are in essence reflective of our peculiar political realities in the state. In essence, we are fully mindful that it may be in the overall interest of the party to welcome into its fold new members, yet it is even more in the interest of the party to ensure that internal democratic functionality and equilibrium is maintained as a critical prerequisite to keeping the party on the track of growth and success enjoyed up to this moment. May we at this point reiterate that a level playing field for a free, fair and transparent primary election which has been promised us by the Benue State leadership of the PDP remains the only option by which the party could credibly and successfully nominate a governorship candidate to the 2019 governorship election if indeed the party is serious at recapturing power from the present APC controlled Government in the state. We want to also state categorically that, while we may not oppose to any group or individuals from joining and participating in the affairs of the party in state, we are strongly opposed to a purported unilateral decision to dissolve the executives of the party at all leaves in the state, so as to accommodate or give undue advantage to any group or person angling to join the party. This will certainly be resisted by all of us, the undersigned 13 Governorship Aspirants. We hereby conclude by assuring the national and state leaders of our great party of our continued unalloyed support, as has been exhibited over the years since 2015, in the belief that such naturally has entitled us to a credible nomination process as a right and not a privilege, in the overall best interest of the party.